I wanted to get really festive this week and so the ticket for that was to do some good’ol fashioned baking. 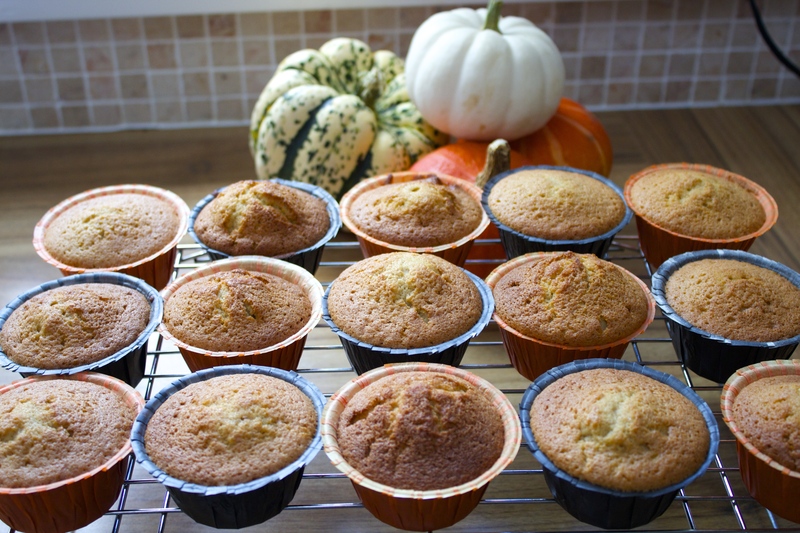 I don’t always have a great deal of time to bake so I just do it as and when I can, or if I’m feeling particularly inspired (this usually stems from The Great British Bake Off- I bloody love that programme!). 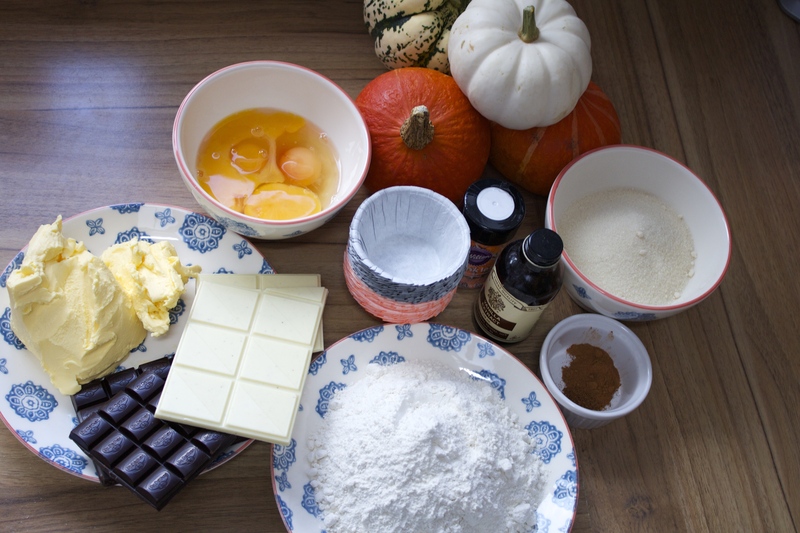 I’m hoping though, that this blog will encourage me to try out a lot more recipes that I can share with everyone. I’ve made this cake batter super straightforward because I was more concerned with the design for the icing over anything else. However, i’ve jazzed the batter up a bit by adding some spices that give it a festive warmth. Also, I just wanted to let you know, the golden caster sugar is completely optional and can be replaced with ordinary caster sugar, I just like the depth and richness of flavour it gives. So let’s actually get to the yummy cakes! (If I do say so myself). 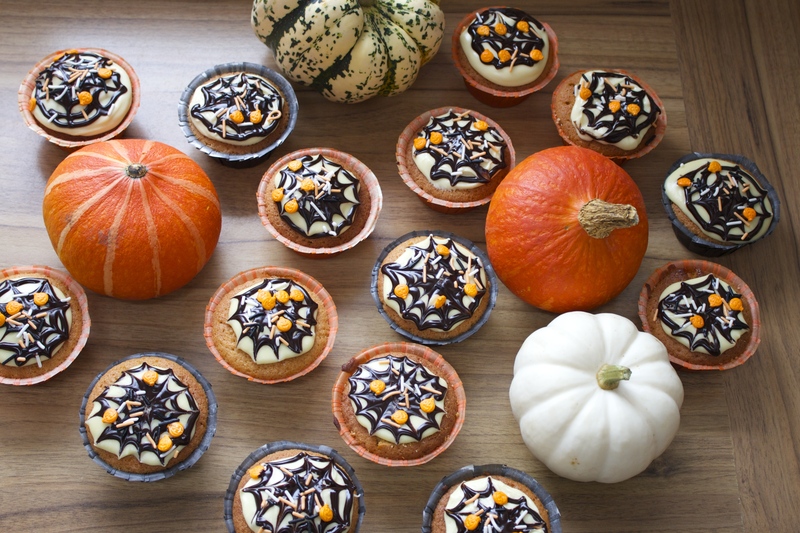 Halloween cupcake cases (or just any that you’ve got in the house. I got some plain orange and black ones in Lawsons). Halloween themed sprinkles (also from Lawsons, but these are completely optional and the cakes might even look better without them, I just decided to go for the whole hog). 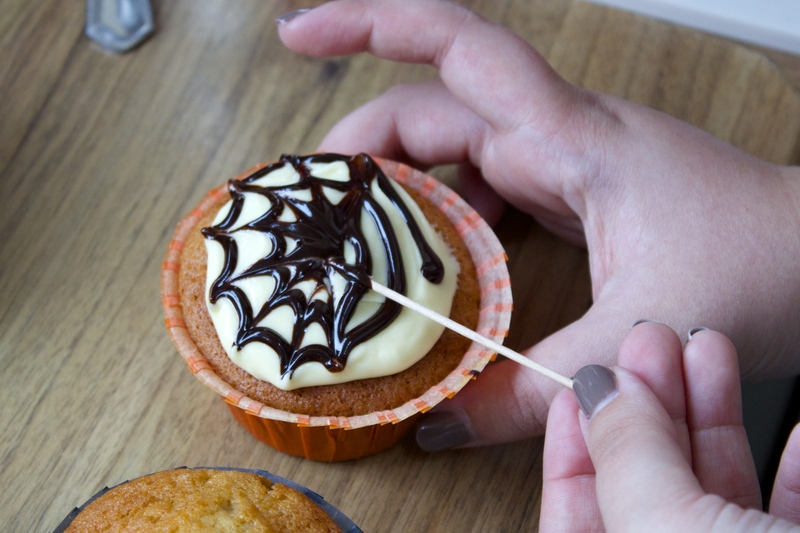 A clear piping bag (no need for a nozzle or anything, you can just make a teeny snip at the end to get the desired outcome and you don’t necessarily need a piping bag at all. 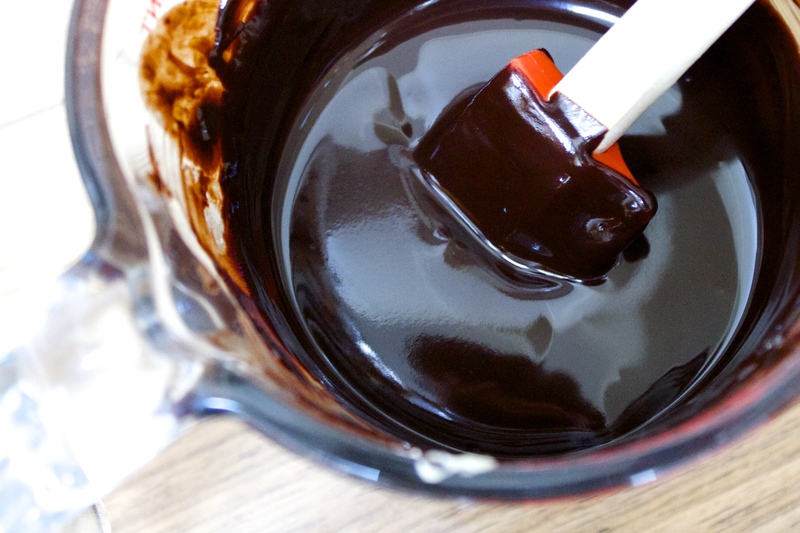 You can achieve the same result by using a teaspoon to drizzle the melted chocolate on. You’ll see later what I’m talking about). Traditionally, this mixture is an all-in-one jobby, but I have my own way I like to do it. Does it make a difference to the over all finish? I’ve got no idea; so if anyone tries just putting it all in a bowl and mixing thoroughly let me know how you get on! So to begin, pop the sugar and butter into a bowl and beat together until well combined, light and fluffy. You can then add the eggs and vanilla extract and beat them in well. Once that’s done (and it shouldn’t take too long providing your butter is nice and soft) add all the dry ingredients and whisk well until no lumps can be found. 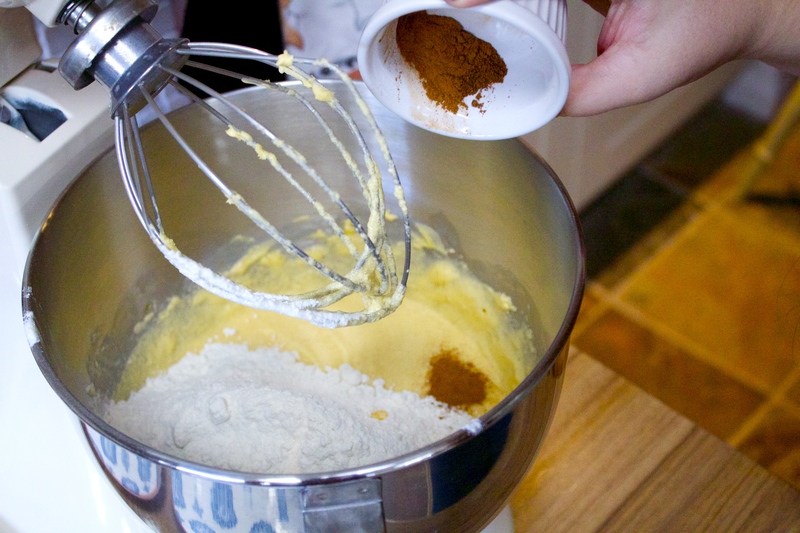 You could sieve the dry ingredients if you’ve got the time and patience. Here I didn’t bother and I didn’t stumble upon any lumps of flour, but that might be because I cheated and used an electric mixer. You have been warned folks! Then it’s just a case of loading ’em up! 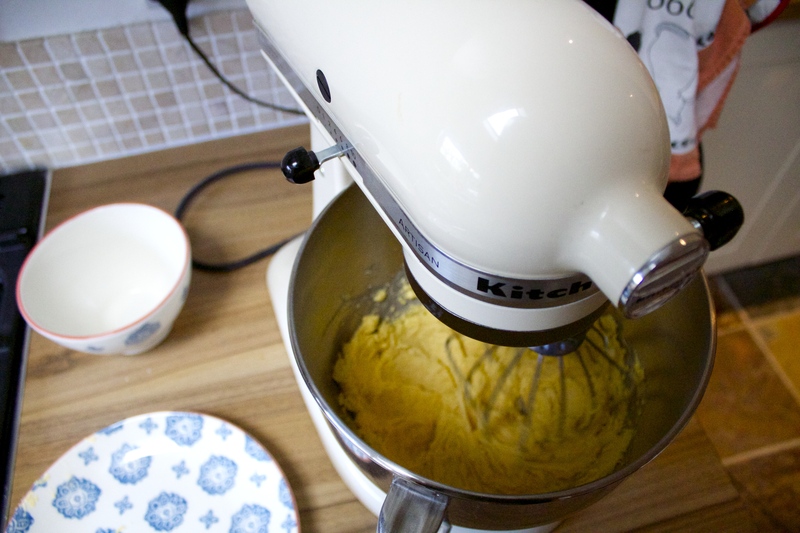 This mixture made about sixteen cakes with the size of cases I used- which were fairly big. So you might get more if you’ve got smaller cases. I filled the cups about two thirds of the way full because i needed a nice rise on them. Pop them into the oven at 180 degrees Celsius for around 18 minutes- mine had a tiny bit longer because they are quite beefy cakes. You’re looking for a nice rise and a golden colour. Do the prick test with a cocktail stick if you’re still not sure. Also, don’t worry if they’ve turned into little mountains, you can use a cerated knife to gently chop off the lumpy bit on the top to make them flatter and easier for icing. I had to do this for some of mine. Leave the buns to completely cool. 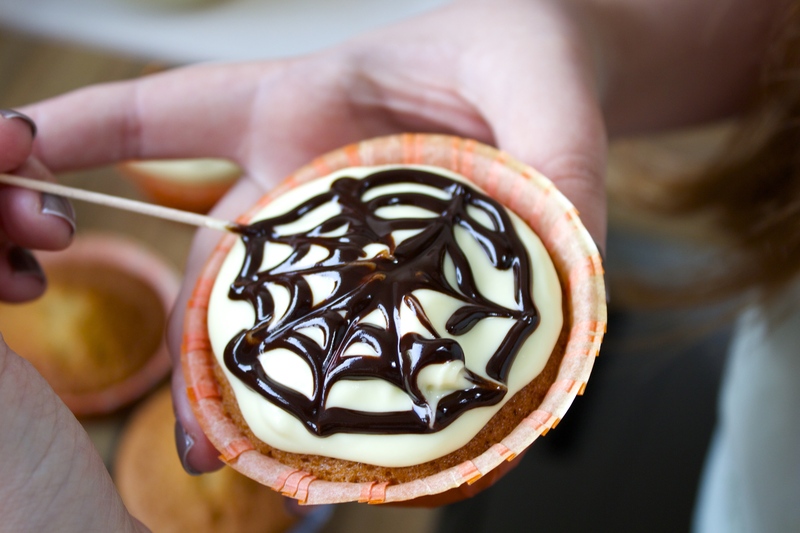 While they’re letting of steam you can get on with preparing the fun bit- the cobweb topping! So I started by melting the white chocolate in a bain-marie with 100g of the butter (don’t use all your butter for this as it will be too runny). Make sure you keep a good eye on it and keep it moving in the bowl because you don’t want it to take a funny turn and either burn or separate from the butter. The end result should be a nice glossy bowl of molten white chocolate that has a slightly looser consistency than it ordinarily would if you just melted it without the butter. For the dark chocolate I took the easy road and popped it into a microwave safe jug along with the remaining 80g of butter. Then just put it in the microwave for bursts of 30 seconds- stirring in-between each burst- in order to get it nice and melted without burning it. Melting chocolate can burn so easily in the microwave so stirring it frequently and only popping it in for shorter amounts of time should avoid this. You should hopefully have an equally glossy looking liquid that runs nicely off a spoon when you lift it from the jug. Now for the best bit of making ’em look all fancy! 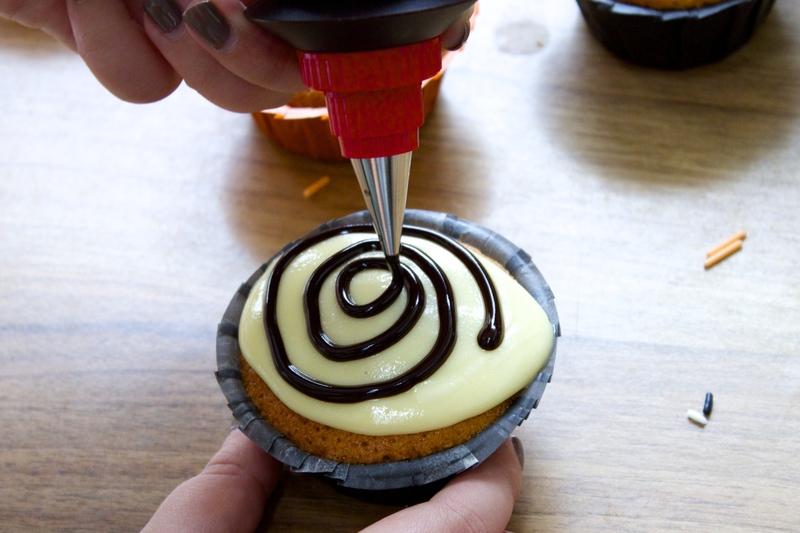 I used a little piping bottle that I got from a brand called “Kuhn Rikon”, but a piping bag or a spoon will work just as well, providing you’ve got a steady hand. 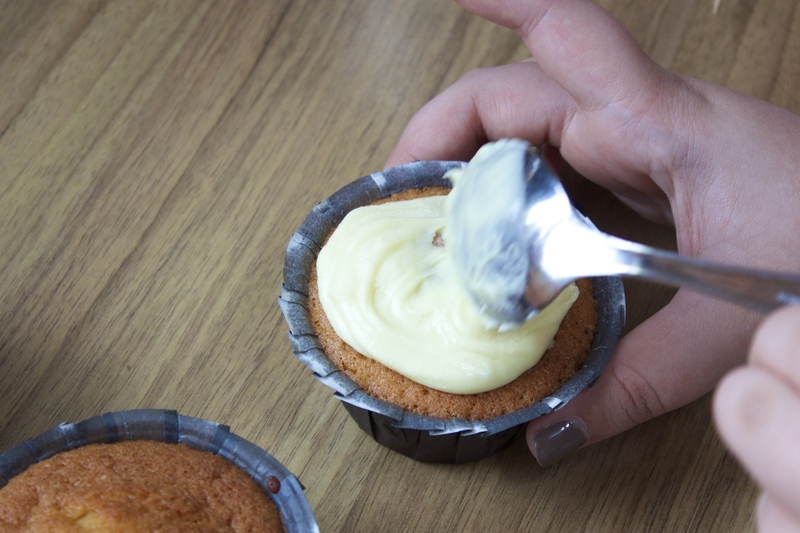 So start by dolloping a desert spoon sized amount of the white chocolate onto your cake- just make sure it doesn’t flood the cupcake otherwise it gets messy! 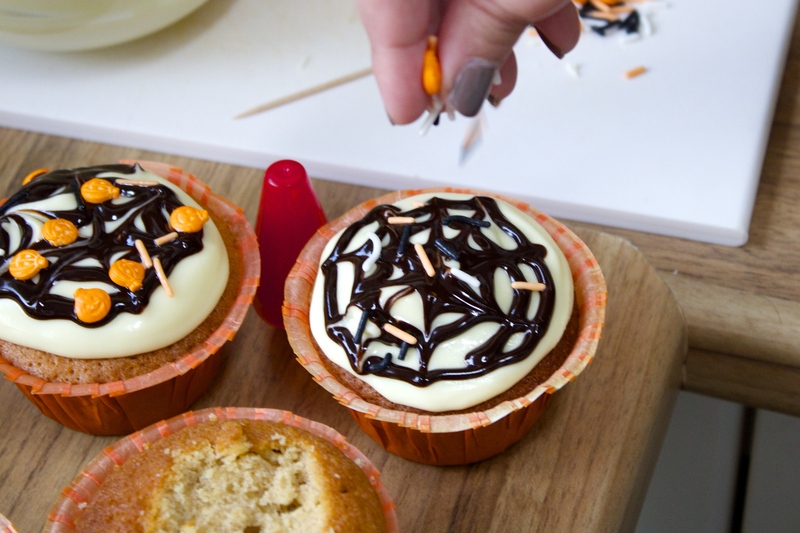 Also, you might want to do each cake separately; so what I mean is complete each cupcake before moving onto the next, otherwise the chocolate could set before you get to create the cobweb. 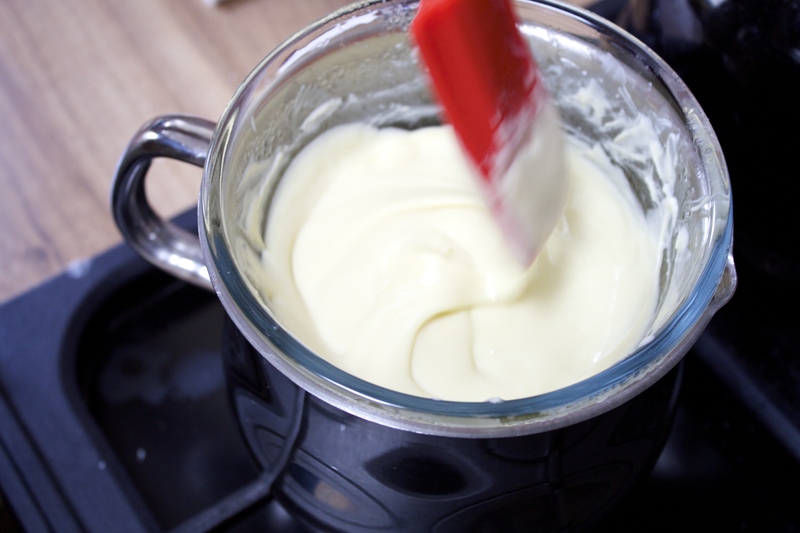 If the white chocolate does start to set before you’re finished, put it back on the hob and add some more butter to thin it out a bit. The same goes for the dark chocolate except you pop it back in the microwave. 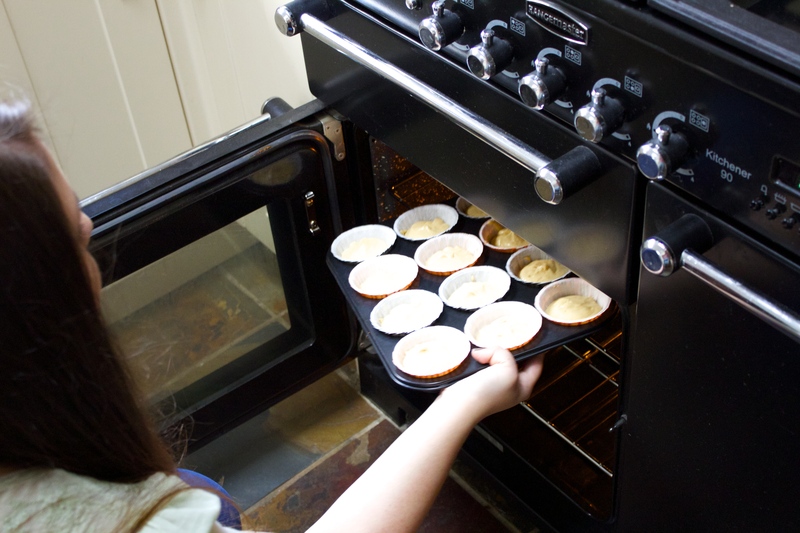 Then take your desired method for the dark chocolate and steadily form a spiral on the cupcake. Don’t worry I’ve got plenty of pictures to demonstrate what I mean! Don’t worry about it being neat. I think it gives it more character if the spiral is a bit wobbly. Then take a cocktail stick and drag the tip outwards from the centre. 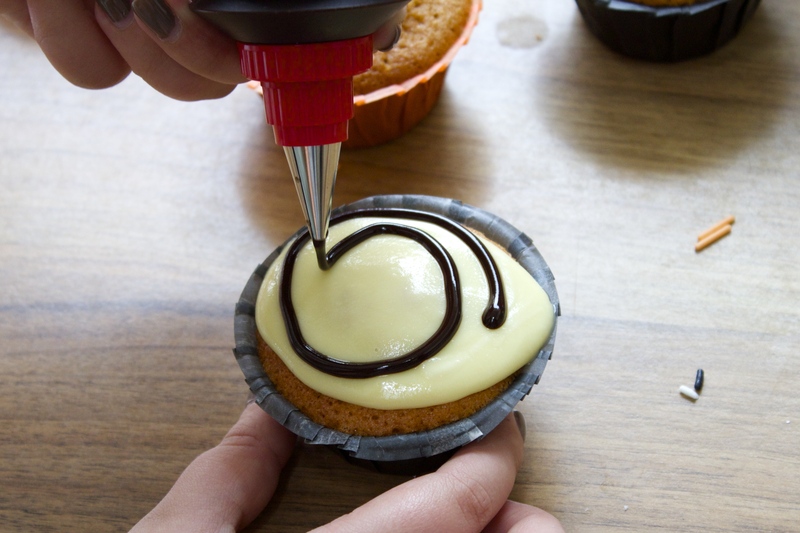 Do this all the way round the cupcake, almost like you’re making a star. Then it’s just a case of putting on some sprinkles! I genuinely had so much fun making these and they tasted really yummy! I hope some of you try making them yourself- if so, I would love to see a picture of them!